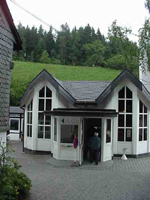 A Lourdes in the Sauerland? "You are glowing like an oven"
The miracle grotto from the slate mountain- a German Lourdes? Tours into the Nordenau cave daily from 8.00 am - 6.30 pm. Admission (unfortunately) 7, - Euro, except for visitors who stay overnight at the hotel Tommes. During the guided tour water from the cave is filled up for free in containers that you bring along with you, it is advisable to bring large bottles or canisters. Tlacote Water: the well is on the Ranch of Senor Jesus Chahin in the town Tlacote, 15 miles from the city of Queretaro which by car is 2 1/2 hours north of Mexico City. The healing well in Nadana, India is in the town of Nadana, around 90 miles north of Delhi, but is temporarily closed. The healing well in Nairobi is in Kawangware near Nairobi, the place of a miraculous appearance in June 1988. Besides the well known healing spring at Lourdes, France, other healing wells have been found in various places around the world since the nineties. The waters from these wells have proven to hold extraordinary healing powers and have received great attention. Many thousands of people flock daily to the water sources in Tlacote (near Mexico City, Mexico), Nordenau, Germany and Nadana (near Delhi, India). In early January 1992 the hotel owner Theo Tommes went alongside a Dutch guest into the disused slate tunnel belonging to the hotel, which was used as a wine cellar. The guest remarked that he felt very strong field lines there, a kind of magnetic field of a special type. Tommes didn't pay any attention to this at first. However, when several ill guests who stayed in the cave felt healthy afterwards, the news of the unusual power spot quickly spread. Since then, more and more people (currently over 100,000 per year) are coming to the cave, hoping to cure their ailments by staying in the cave and enjoying the water. The journalist Guido Brandenburg from the Bild newspaper described his experience thus: "I drank from the water in the energy zone. After five minutes my fingertips vibrated . I thought I was under electricity." Letters of thanks from visitors of the cave that have undergone a cure or relief, are by now filling many binders of the hotel owner Tommes. Several scientific studies have confirmed the healing effects of the water but have not been able to name a cause for it. Research carried out in 1992 by Dr Hans-Jürgen Steinbrück from Frankfurt involved investigating the cases of 42 visitors to the healing spring; of these cases 30 per cent were completely cured; in 28 per cent of the cases there was a significant improvement in their condition; and in 26 per cent their condition had improved to some extent. These findings were confirmed by doctors. Recent research carried out by Dr Gadek, physician at the cancer clinic in Winterberg, on 515 visitors who had drunk water from the spring, showed that, independent of age and personality type, in almost all cases there was a significant improvement in the quality of life after drinking the healing water. He published the results in a reference book with the title: "The Nordenau phenomenon". His conclusion: the relief or cure of diseases after being in the cave can not be a coincidence, this phenomenon simply occurs too often. In his dossier, he recorded fourteen times the strong suspicion of a "spontaneous remission", ie the complete cure of a cancer disease after a visit to the cave. Quote Dr. Gadek: "We face a real phenomenon - annoying." The Japanese molecular biologist Prof. Shirahata got 1000 liters of water and led an eight-year study involving over 500 patients with various ailments. Spectacular results: In almost all diseases, there were positive changes. According to Shirahatas research the water has exceptional antioxidant properties. It is unclear however, where this amazing effect is coming from. Dr. Gadek assumed an unknown form of energy. Astudy by Dr. Knapp points in the same direction. He investigated the water by means of electro-photography and found a much greater energy dissipation than in a comparison of water from a nearby creek. Stranger still, water at the spring spirals to the left, but five meters further on it spirals to the right. Auto-suggestion has been ruled out as cause for the phenomena. Animals are also cured by the "miracle water". A study by Professor Fritz-Albert Popp in Neuss, showed that even algae are much more vital and healthier through the Nordenau water. The British author Benjamin Creme, claims that the healing waters are created by a group of highly evolved spiritual teachers - the Masters of Wisdom - who are beginning to take an active part in our daily lives. Their leader, named Maitreya, has been appearing to individuals and groups throughout the world and is 'energizing' water sources close to the places where he is appearing. One such appearance, on June 11, 1988, at a church meeting in Nairobi, Kenya, was documented by CNN. This energizing, he explains, means that part of the physical atomic matter of the water is actually transformed into sub-atomic matter (or light). When weighed in a large quantity (a liter or more) these charged waters are lighter than ordinary ones by 4-8 percent. Creme claims that in time Maitreya will create a world wide network of healing water sources, numbering 777. They will become more potent over the coming centuries, leading to a greater vitality and longer life span for the human race. Many pharmacies have made different homoeopathic remedies from the healing waters (ie globuli, skin ointments etc.). West Apotheke, Senator Schwarz Ring 24, 59494 Soest, Telefon: +49-(0)2921-96260, Fax: +49-(0)2921-92631.
the Leonardo Apotheke, Mittelweg 30, 20148 Hamburg, Telefon: +49-(0)40-456509, Fax: +49-(0)40-451176 does not ship "Aqua Nordenau" to other pharmacies. Apotheke im Bahnhof Südkreuz, General-Pape-Str. 1, 12101 Berlin, Telefon: +49-(0)30- 78897374, Fax: +49-(0)30-78897376.